About 70 percent of computers infected with this threat are in the US, according to antivirus firm Trend Micro. Keyloggers are easily downloaded, and can infect machines simply through a visit to a site such as YouTube, social networking sites like Facebook, and other so-called “legitimate sites,” said George Waller from StrikeForce Technologies. Handset makers are slow to push fix to users, and fragmentation is not helping in the enterprise. Google quickly addressed a mega flaw in its Android mobile operating system after security researchers brought it to the company’s attention earlier this month, but those fixes appear to be slow in reaching handset owners. “Samsung and HTC have both shipped some patches for some devices,” Adam Ely, co-founder of Bluebox, told CSOonline. Bluebox uncovered the vulnerability that could impact 99 percent of some 900 million Android devices in the world. “The information from the manufacturers and carriers that’s coming in is pretty spotty,” Ely said. Typically, handset makers push fixes to their latest models before addressing problems with older models. “They generally will first fix whatever’s most popular in their market, whatever they’re trying to push, and work backwards,” he said. Rapid7 Vice President and General Manager for Mobile, Giri Sreenivas, agreed that handset makers aren’t being very transparent about how they’re tackling the Bluebox vulnerability. “It’s likely that the first devices to see the fix beyond the Nexus devices, which are managed by Google, will be the Google Experience devices from HTC (HTC One) and Samsung [Galaxy S4],” Sreenivas said. “We have not seen any evidence of exploitation in Google Play or other app stores via our security scanning tools,” Scigliano said. In addition to the patches it’s pushing, Google has also configured its online app store, Google Play, to scan apps distributed through the outlet for the defect, as well as offering a program called Verify Apps to check apps obtained from outside Google Play for the flaw. Shortly after Bluebox discovered its master key vulnerabililty — named so because it allows a hacker to modify an application package (APK) without breaking its cryptographic signature — a similar vulnerability was posted to a Chinese language website. “Google has patched the second vulnerability posted on the Chinese website, but similar to the master key vulnerability, there is no transparency from the OEMs about how and when to expect these patches to reach end-user devices,” said Rapid7’s Sreenivas. Although one of the co-founder’s of Android, Rich Miner, recently discounted the negative impact fragmentation has had on the operating system, Bluebox’s Ely said his firm had found that the ecosystem’s fractured landscape was definitely contributing to mitigating the serious problem. While the Bluebox exploit has been treated as an apocalypse waiting to happen by some, others are more sanguine about the discovery. “These issues have been blown out of proportion,” said Ken Pickering, development manager for security intelligence at Core Security. AT&T is offering no-contract smartphones and tablets on monthly installments, with the promise of an annual upgrade, taking on similar offers by competitor T-Mobile US. Starting July 26, the U.S. carrier is offering customers in the country a new smartphone or tablet every year with “no down payment, no activation fee, no upgrade fee and no financing fees,” the company said Tuesday. After 12 payments, customers can trade the device in and upgrade to a new one, again without a down payment, or they can continue to use the earlier device without further payments after 20 months. After the upgrade, the remaining unbilled installment payments on the previous device are waived. AT&T’s no-contract “Next” plan saves it the expense on hefty subsidies on smartphones for customers, which carriers typically hope to make up through service contracts usually running for two years. It also offers customers the opportunity to upgrade to newer smartphone and tablet models. The AT&T Next program is open to new customers or existing subscribers that are eligible for an upgrade. T-Mobile launched last week an upgrade offer that will let subscribers for a monthly fee of US$10 trade in their existing phones for a new model at a T-Mobile store as often as twice per year, once they’ve been on its Jump plan for at least six months. Customers don’t have to wait until the end of a two-year contract or finish paying off a device in monthly installments. When they upgrade phones, customers will not have to pay remaining installments and can purchase new phones for the same price as new customers. The $10 fee also offers protection against malfunction, damage, loss or theft. In March, T-Mobile introduced plans that let consumers pay for a new phone in installments rather than sign a two-year contract. Customers can also use their own unlocked device. AT&T Next is available for any current smartphone or tablet available from the carrier. Device installments range from $15 to $50 with the Samsung Galaxy S4 having a monthly installment of $32, the company said. If the wireless service is discontinued, the balance installments fall due. Discounted handset offers coupled with service plans will continue, AT&T said. Tumblr security lapse – iPhone and iPad users update your passwords now! Tumblr has released a “very important” update for their iPad and iPhone apps following what they describe as a “security lapse”. It appears that passwords were being sent over the internet unencrypted, making it easy for anyone with bad intentions and a little technical knowledge to harvest Tumblr users’ login details. We have just released a very important security update for our iPhone and iPad apps addressing an issue that allowed passwords to be compromised in certain circumstances¹. Please download the update now. According to The Register who broke the news, a source approached them after failing to get the issue resolved by Tumblr’s support team. It looks like the previous versions of the iOS apps weren’t logging users in using SSL. But Tumblr hasn’t said much, and their lack of transparency means we are left wondering whether or not this has indeed happened. Fans of Tumblr – which was recently acquired by Yahoo – who access the site via Windows Phone or Android devices appear to have been unaffected. So if you use Tumblr on your iPad or iPhone, download the latest version of the app now. Then change your password, both on Tumblr and anywhere else where you have used the same login credentials. If you’re having trouble choosing a new password, watch this video. And remember to always use a different password for each site. You can always use a password manager such as LastPass or KeePass to remember them all for you. With media and tech hotshots gathered here for Allen & Co.’s annual deal-making powwow, Cook spent some time recently huddled with Comcast CEO Brian Roberts, according to sources. Passwords are at the root of online security problems because when typed into browsers, sent over open networks and centrally stored, they are easily compromised leaving the networks and accounts they “protect” vulnerable to criminals. But that can all change with a digital image that can save your online identity. Authentify introduced an alternative to overworked passwords, an online security app that turns mobile devices into secure personal authenticators. 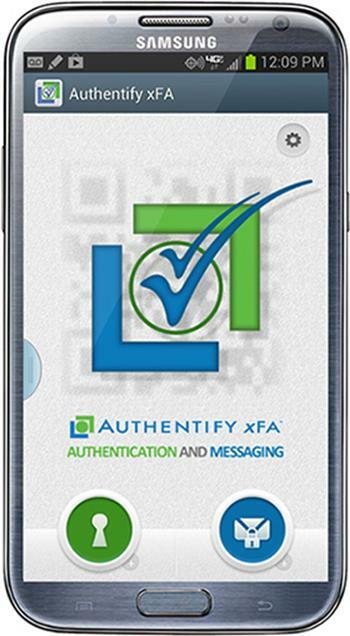 Combining enterprise control with user convenience, the Authentify xFA Service replaces passwords with a mobile xFA app that scans an on-screen, short-lived cryptograph—a digital image that, when scanned, activates a PKI digital certificate for strong authentication—and turns a smartphone into an authenticator that delivers server-to-server class endpoint security with no effort from the end user or the enterprise. xFA, which stands for “x” factors of authentication, also provides strong multi-factor authentication supporting voice biometrics and other forms of secure messages allowing enterprises or their users to choose the level of authentication the transaction warrants. Authentify xFA can be used by any online service provider or enterprise that needs strong protection at time of logon but also needs a simple user experience. xFA provides greater protection to financial services, e-commerce, medical insurance firms or any enterprise/SMB private networks from password exploits or breaches without losing productivity or inconveniencing users. Authentify’s xFA defeats a broad range of exploits designed to steal passwords or hijack online sessions such as man-in-the-middle, man-in-the-browser, viruses, Trojans and keyloggers, and does so with a more engaging user experience than other technologies that layer on top of one another. Google Voice, Gmail and Hangouts users will soon be able to make landline telephone calls free of charge to people in the US and Canada from anywhere in the world. The search giant announced the news today on its Enterprise blog along with a host of updates to Hangouts, Voice and Gmail, which will be rolling out in the next few days. “We’ve heard loud and clear that you miss the ability to make calls from Gmail, so today we’re happy to announce it’s back – and better than before,” the post stated. Calls made from Google users in the UK to UK landlines currently cost 2.4p per minute. 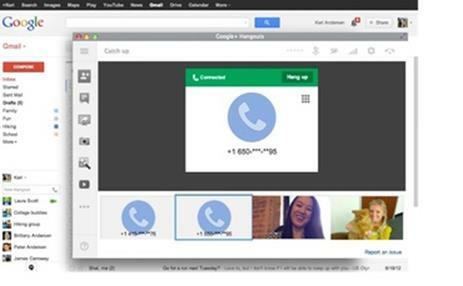 In addition to the news of free calls, Google showed off the ability to add multiple landlines to a Hangouts call, along with the addition of more frivolous options, such as adding applause and other sound effects to calls. Google also reiterated that Hangouts would eventually be the future of Google Voice, with more additions to come. “As we’ve said before: Hangouts is designed to be the future of Google Voice, and making and receiving calls is just the beginning. So stay tuned for future updates,” the post said. While this news may please many European users, Google is not in the good books of the European Commission, with demands being made of it to delete its unlawfully collected Street View WiFi data by the end this month. In addition, Google has claimed it has done a ‘pretty good job’ to alleviate the EU’s concerns over a lack of competition among European users. For Model S drivers, Tesla Motors‘ oft-delayed Supercharger announcement was worth the wait. The electric vehicle company today explained how it will expand its network of high-speed electric vehicle charging stations across North America (and hinted that the technology will come to Europe and other areas in the future). The Supercharger roll out will take place as follows. The number of Supercharger stations will triple from eight today to 25 by the end of June, bringing coverage to more of California, the Pacific northwest, in Texas between Austin and Dallas, and in Illinois and Colorado, as well as the east coast. By the end of the year, Superchargers “will connect most of the major metro areas in the US and Canada,” Tesla says, and by a year from now, the network will cover “almost the entire population of the US and Canada.” You can see the 2015 map above (click to enlarge) and there’s an interactive map over on Tesla’s website that shows the predicted coverage area through the years. CEO Elon Musk said on a conference call today that he thinks there will be more in the ground by 2015 than the map shows today. Musk also said there is grid storage – using huge, half-megawatthour batteries – at some of the stations that have solar power, where stationary batteries take energy from the sun and store it until a Model S pulls up. That means these stations can be completely taken off the grid, so that “even if there is a zombie apocalypse,” Musk said, “you will still be able to travel throughout the country using Superchargers.” Good to know. 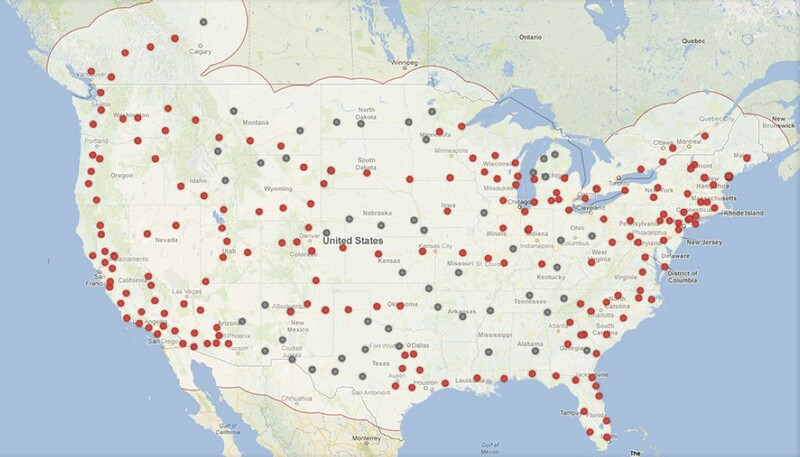 On top of the increased number of stations, Tesla is also upgrading the Supercharger technology to be faster. Instead of charging at 90 kW, the new rate is 120 kW, which means you can add three hours of driving to a pack in “just over 20 minutes.” Tesla previously announced that Supercharging is and will remain free, for life, which makes going on a road trip awfully affordable once you’ve paid your $80,000 for a Model S. Musk said he’s going to do just that, retracing a college road trip from LA to NYC, with all of his kids (he has five) later this year. 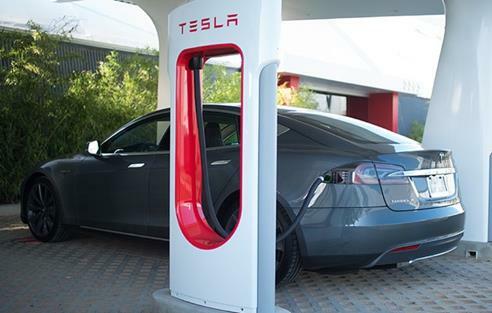 Tesla opened its first Superchargers last October. At the time, the company said each station cost around $250,000 to install. Today, Musk said the stations cost $150,000 without solar and $300,000 if they have solar panels. Electric vehicle buyers enjoy green energy. Turns out, folks are more likely to buy a plug-in vehicle if they know the electricity that will power the car, or at least some of it, will come from a renewable energy source. That’s the conclusion of a study produced by Environmental Research Letters (ERL), which found that plug-in vehicle demand in regions with a “green electricity” option is a stunning 23 percent higher than in areas without a clean-energy option. Researchers from Canada’s Simon Fraser University and UC Davis polled prospective electric-vehicle and plug-in-hybrid buyers and found that buyer interest jumped where there was a chance to double-down on their green cred if they could use something like, say, solar power. For those with a little time on their hands, here’s the report. Automakers like Tesla Motors, with its solar-powered Superchargers, and BMW have already shown they understand the connection between green energy and selling EVs. The Germany-based company is getting ready to start selling its first mass-produced plug-in vehicles under its new i sub-brand – the i3 is due towards the end of the year – and last year struck a deal with Real Goods Solar to offer special deals to ActiveE drivers who wanted to charge green.